You shouldn't just delete the topics, but also block those "guys". Of course we don't just delete the topics, we block the spambots first and then delete these topics or messages, created by spammers. But that doesn't help, new spambots will be created. But they must not exagerate. I lost your email adres. Can you email it to me ? Thanks. Christiane and I keep blocking and deleting dozens of spams every day. I notified Ruslana's team already several times - without success so far. I'll try again. It's weird, I mean, there've never been SO MANNY of them. There used to be some such... occasional invasions, but this now seems to happen regularly and also when you see the "visitors" below.... it's crowded, lol. It's weird, I mean, there've never been SO MANNY of them. 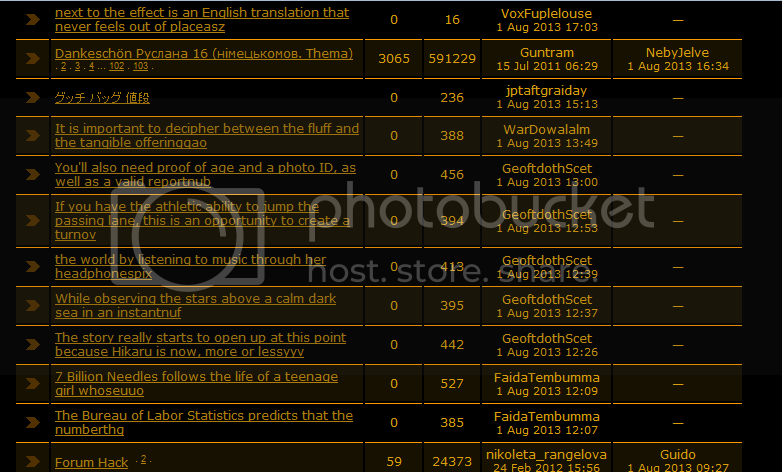 I think it's because of safety gaps appearing because the forum is old and not updated. Then current admin doesn't look after it - like all previous admins. Hm.... Maybe you're right. I was also referring to "my" time, when it was quite active-so, maybe then we were here all the time and noticed those before they'd opened 10-20 topics. But anyway. I wonder if everyone's moved to FaceBook or there is another UA forum or Ruslana's just lost her fans and their interest. maybe then we were here all the time and noticed those before they'd opened 10-20 topics. No, at that time there were only very rarely spams. The daily spam flood appeared only in the past few months. The Ukrainian fans seem to have moved to vk. It's a pity, because it's not suitable for a proper conversation. I always wonder who creates these bots and why. If there were people behind it who want to sell something, they wouldn't create bots which post completely senseless texts and which just annoy everyone. Hello everyone! I decided to look at the forum .... Yes sadness. That's right! But why? It's because, as the current administrator and performs all previous guidance of management Ruslana. The initiative is punishable. No active alternative communities Ruslana on the network. So Ruslana lost their fans and their interest .... Already a very, very long time. I'm glad you understand it too! VK is suitable only for informational support, and does not provide the full functionality fan club. She is constantly engaged on the strength of three men ... They basically provide informational support. The discussions initiated by me - are not discussed, no activity. Periodically, contests .... Archive of works no ... they are processed somewhere ... and to the public they are not. I want to create a truly great cause! Therefore, I am now a volunteer of the Red Cross Society of Ukraine which is part of the International Committee of the Red Cross. This forum never had an admin who was doing an acceptable job. I know that you could fix the problem with the spambots. I think they are doing a good job, but it's not what I would call an active fan club. I also take a look at this site, also looking at Ruslana's personal VK profile. haha np I've been a really bad mod for the last few years. Sorry for that people. I've been a really bad mod for the last few years. Since the forum error which occurred last week was repaired your avatars have disappeared. Strange that only avatars of "new" people disappeared. Did you try to upload them again? I don't even know how to add one. This forum hack thing is becoming really annoying. - Conversion and modernization of the existing one. It is much more difficult than to put a new engine. Because of the low attendance is meaningless.